We remember this charming little toy from years ago, and are proud to be able to present it here once more.Traditional musical boxes normally have a single tune (unless you have an advanced version with different cylinders). But in this case, the music box, which is hand cranked, has a strip of paper that passes through it, and the little holes in this strip determine the tune. The Music Box comes with one strip of paper already punched with the tune 'Brahms Lullaby'. There are then 2 blank strips of paper and a hole punch, which will allow you to create tunes of your own! 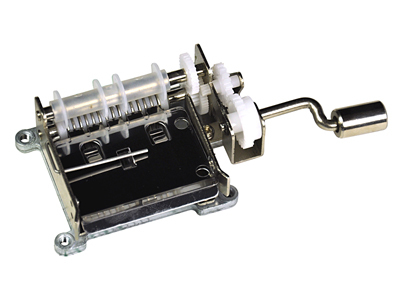 It makes for a fun and interactive way to learn and create music.The Music Box has a two octave range, and can play chords, not just single notes. The set consists of the Paper Strip Music Box, a Hole Punch, one sample strip of paper with 'Brahms Lullaby' already punched, and 2 Blank Melody Strip Cards. The Melody Strips are 48cm long, and 4cm wide. The Music Box is 10.5cm (including handle) x 4.5cm x 2.75cm high.Further blank strips are available. As well as a fun way to learn about music, there are also some serious musicians out there who are using the music box, including Hannah Peel. There is also an app that has been written that allows you to test out new songs and compositions, and when you are happy with the result, you can print out a guide to help you punch out the paper strip. Great for anybody musically minded as a stocking filler. Brilliant! Bought it as a gift for my 8-year-old niece and she is enchanted. Thanks! A present so not used yet.